Welcome to my blog. 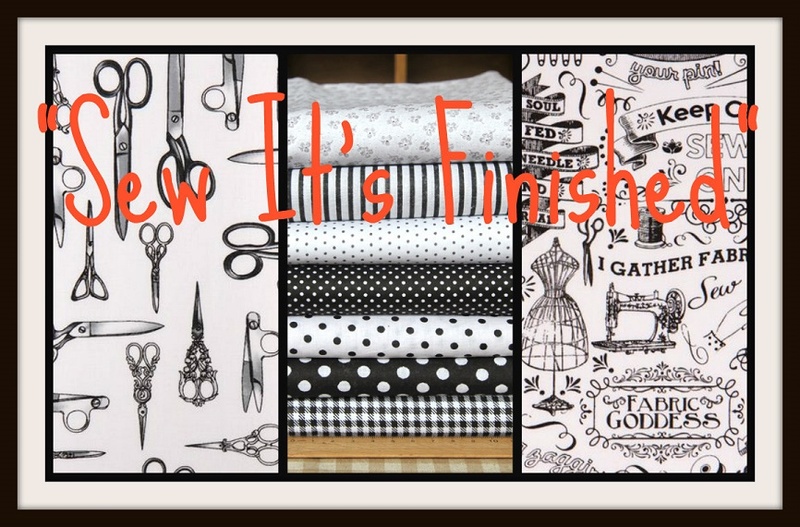 I use this blog as a repository of sewing comments, pictures and sometimes general chit chat! 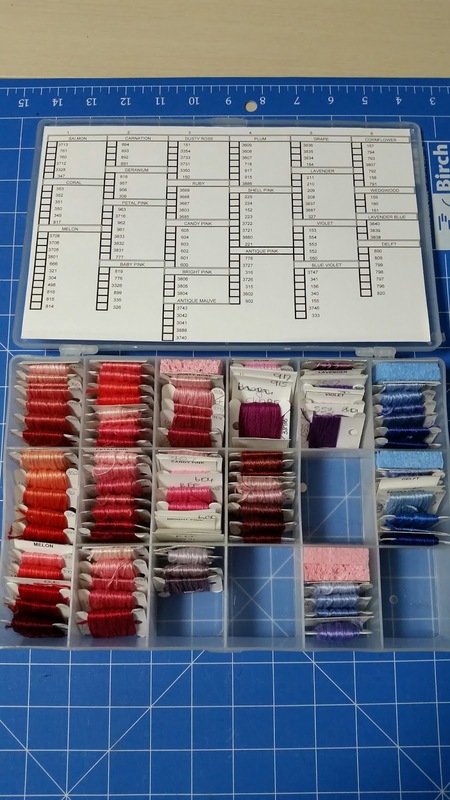 This post is all about organising DMC threads - It might appear that I am a bit OCD from this - I don't think I am all that OCD, but perhaps in some areas I am . . .you can be the judge! If you are not into organising...you probably don't need to read on!! And if you do - take a deep breath. or grab a cuppa! 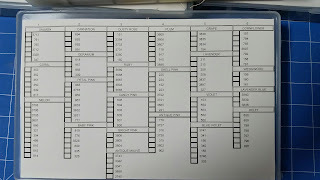 So, what I do is print the spreadsheet and trim it to the size of the lid of the box. That sits in the lid. 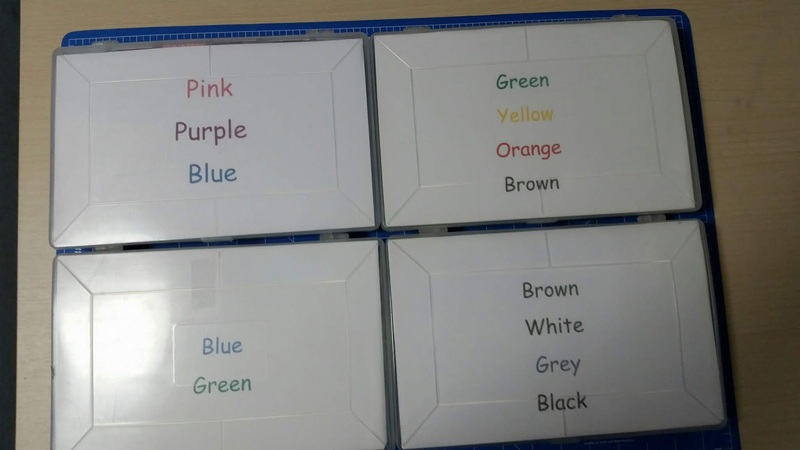 I printed a page for each box to show what colours are in each box. Inside the box - I have a square of cardboard with the colour group name, then each bobbin for that group, then the next colour group name etc - to match the list in the lid. 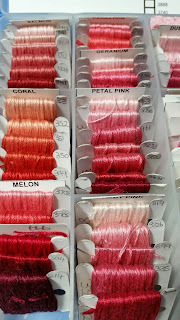 So - how do I find a colour by number?? 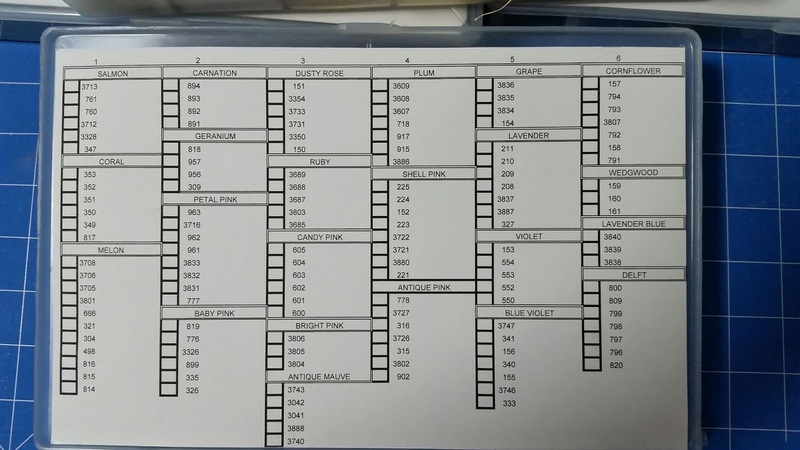 usually I can scroll down the list if I know what sort of colour - or if I am desperate - I open the spreadsheet file and search for the number - it will then tell me the colour group and I can find it easily enough. 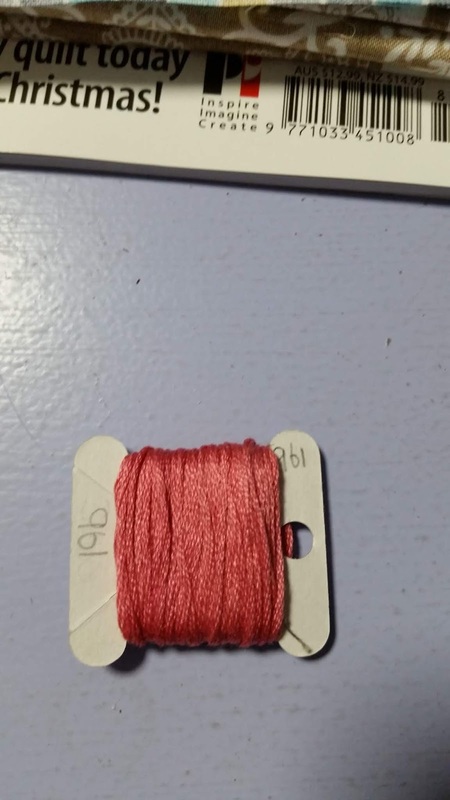 Now - to make it even more OCD - when I remove threads for a project - I have cardboard squares cut to size and I write the colour number and what project the thread is for....then if I really need it for something else I can (usually) find it. 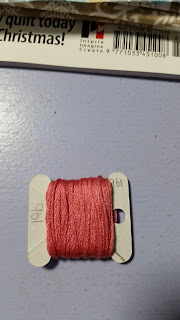 This is my pink/purple box - there are a lot of threads missing.....you can also see bits of sponge that I have cut to help fill in the gaps so that the threads stay upright - that is not a fool proof system...but the best I could think of . . . If you would like the Excel spreadsheet - I am more than happy to share it - include your email address in your comment (unless you are a regular commenter and I know your email address already). I can't guarantee its totally accurate and it doesn't include the latest lot of new colours (numbered up to 55), but if you wanted to do something similar to me it will save you some time. 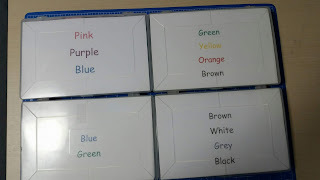 I don't still have the document I used to print the colour group names. Yep - OK - over the top - but it works for me. It looks like a good system Susan....I like the way you pop a note in to tell you what and where the thread is - that's my problem; I start a good system then take theings out to use and it all falls to custard from thereonin!! this is how I organise my threads too. It doesn't make sense to me to do it in numerical order. I think it only would if you only ever did cross stitch or embroidery projects from a pattern and stuck with the original colours. 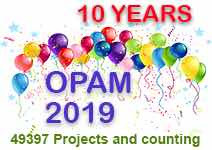 Thanks for visiting and leaving a comment - I do appreciate it and I do read them all. I try to respond to everyone...but sometimes I can't find you . . .or sometimes life gets in the way. Thanks for being a Follower!! Maybe you would like to join . 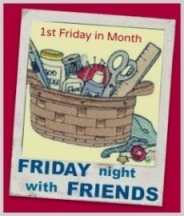 . .
February - Quilts for "Caring with Quilts"